Car glaze is the product of choice for many detailers that want to quickly hide imperfection by filling them in or to enhance the gloss of their paintwork. They are designed to be used before wax or a car paint sealant for a long lasting finish. The best car glaze is the Chemical Guys Glossworkz Glaze, which is suitable for all colored paints and provides a deep wet shine that includes UV blocking agents. Glaze should be used after polishing because it does not contain any abrasive qualities. They fill in microscopic imperfections and do not remove them, which is often misunderstood by people new to detailing. Using a car glaze is best used after polishing but before using a car wax. However, you can regularly keep it topped up because the imperfections may begin to reappear after a few weeks. You can even apply multiple layers for further filling and gloss. For removing scratches, swirl marks or other defects, a car glaze is not want you require. It’s primary used to hide imperfections and shine on a range of surfaces. It is not permanent and will not correct imperfections. Below is a list of the best car glazes that will fill in any remaining imperfections and enhances the gloss finish of the paintwork. The Chemical Guys Glossworkz Glaze is suitable for all colored paints and provides a deep wet looking shine. It can be applied by either hand or machine with a finishing pad and the brand claims that it will never cake up. Overall, it is the best car glaze that works with all paintwork colors and leaves a dynamic shine. The main drawback is that it comes with an expensive price tag but it worth paying the extra considering the UV sun blocking agents. Meguiar’s is a brand that need no introduction and their Mirror Glaze formula is one that they claim is a top-performer compared with all others. It restores the deep wet shine and is safe for all paint finishes including clear coats. It is one of the most popular car glazes available that has been developed by the reputable Meguiar’s brand. When followed by a long lasting wax, the glossy shine will remain for weeks. Overall, the Meguiar’s Mirror Glaze ticks all the boxes and offers excellent value for money when compared against the alternatives. 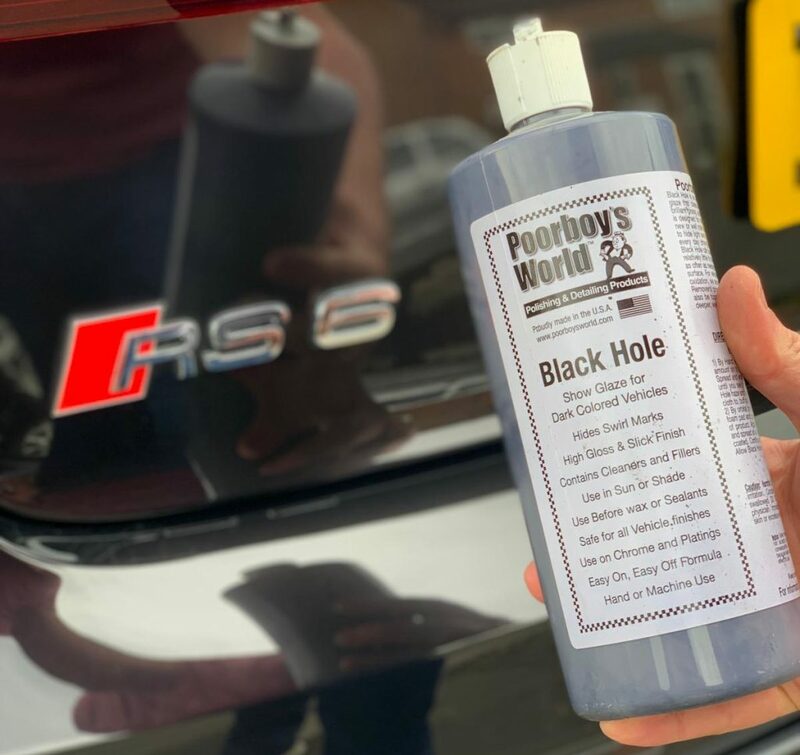 Poorboy’s Black Hole car glaze is designed for black and dark colored paintwork and provides a wet showroom shine. It is designed to hide minor defects such as swirl marks and enhance the gloss finish to your car. Dark colored vehicles are the worst for showing imperfections such as swirl marks. However, the use of the car glaze by Poorboy’s World is an easy way of preventing imperfection appearing by filling them in with this formula. For dark colored paintwork, this is the best car glaze and one that I personally use on all my black cars. Poorboy’s do offer several other glazes to suit other colored paintwork too. Adam’s Polishes is another USA brand with a variety of different detailing products available. Their car glaze is suitable for use on all painted surfaces as well as chrome and glass. Using this Brilliant Glaze by Adam’s allows you to achieve a deep and wet shine with ease. Unlike many other hazes that can take a while to haze up, the Brilliant Glaze will haze up instantly. It has a new and improved formula with extra filling properties that are great for temporary masking imperfections. Overall, it is the one of the best options for those looking for a glaze that is easy to apply and provides excellent levels of shine. 3M is a reputable detailing brand and their Hand Glaze formula contains no silicone or wax that is designed to increase surface gloss. The professional quality formula restores the OEM appearance and works particularly well with older vehicles. It is worth noting that 3M specifically state that you should not apply this formula in direct sunlight or on hot surfaces. If this is not possible, we strongly recommend choosing one of the alternative car glazes. The 3M Hand Glaze is an excellent all-rounder but it does come with a premium price tag but the popularity is a good indication to how good it is. Although some people may refer to a glaze as a car polish, this is simply not the case. A car glaze does not contain any abrasive properties, which means that it will not remove any imperfections within the paintwork. The formula instead fills in any scratches or swirl marks and temporarily masks them for a show car shine. Most will mask the imperfections for a week or two but you can lock in the fillers by using suitable wax. To help you make an informed buying decision, we have produced the below buying guide regarding car glazes. The purpose of a car glaze is to fill in any remaining imperfections. Therefore before application, you may decide to remove any defects using a polish or compound. Once this is complete, it provides the perfect surface for application of the glaze, which you can then protect with a layer of wax. You may also decide to double up the application for further filling of the imperfections. Compared to car polish or rubbing compounds, the majority of car glaze formulas can be applied by both hand and polisher. However, not every glaze can be used within direct sunlight or on hot surfaces. Therefore, if you have not got access to shade or a garage, this will be a key factor to consider. Some manufacturers provide a car glaze suited to a certain type of paintwork. For example the Poorboy’s World Black Hole is suited to dark colored vehicles and provides a deep wet shine. Those that are designed specifically for your colored paintwork often have the edge. Some formulas can even be applied to different surfaces such as chrome or even glass. Some car glazes are known to have an extensive hazing period, which can mean a lot of time waiting around. However, all of the recommendations within this article are fast acting and haze up within minutes if seconds after application. To beat the competition, many manufacturers will include additional features to improve their glaze. The Glosswork Glaze by Chemical Guys includes UV blocking agents for example, which is an excellent addition for those living in sunny climates. Some glazes can even be used on a range of surfaces that include chrome, stainless steel, glass and much more. Car glaze is an effective product but is often mistaken for a car polish, which is why it gets some bad reviews. However, for those that understand the purpose of a glaze, they can be used to good effect for achieving maximum shine with very little effort. All of our recommendations are suitable for a range of paintwork colors and are fast acting. Using a car glaze is far easier than many other detailing products and it cleans the paintwork for maximum shine. Removing defects such as swirl marks involves a lot of effort and time but using a car glaze will take a fraction of the time.